First up in the routine, and only if I've been wearing heavy-ish makeup, I use a micellar water to begin the cleansing process. Currently Bee Good's 3-in-1 Cleansing Water* is my go to, it's nice and refreshing and doesn't leave a residue on my skin. Next up is a gentle creamy cleanser, I like my cream cleansers to be light and fluid, not a thick gloopy cream and so this little (totally adorbz) sample of their Moisture-Rich Cleansing Lotion from Suki is perfect. I've nearly used all of this up now after receiving it in my content goodie bag last month and I'll be oh so sad when it's all gone. It removes makeup so easily and doesn't leave any film or build up behind on my skin once it's rinsed away, just super soft cleansed skin. My skin had been looking really dull up until recently and I realised it was because I was lacking an exfoliating step in my routine after my very unnatural exfoliating toner finally ran out. Instead of looking for something new I've decided to bring the clarisonic back into my routine after having a break for a few months, and it was just what I needed as my skin is looking so much better already. I use it every other night with my Osmia Organics Black Clay Facial Soap for a deep clean and serious skin-buffing session. What do you think of my evening skincare routine? too OTT? Ahh I've just found your blog through twitter and I'm so glad I did, I absolutely love it! I've heard such good things about Bee Good's products, I'm really curious to try them out! 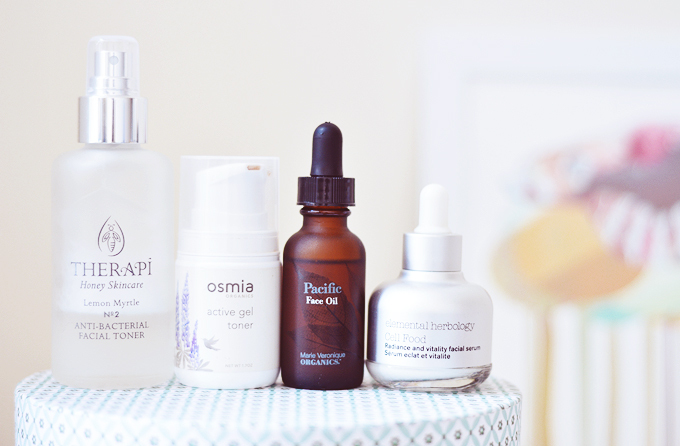 Amazing routine~I really wanna try the cleansing lotion from SUKI and the facial soap from Osmia. One question though, how can you use Clarisonic with the soap? Would it foam up enough? Thanks.